Sometimes overcoming the obstacles in your life is not an endeavor that you can take on by yourself. Substance addiction is a burden that requires the help of those around you, whether we’re talking about your friends and family, your support network or a team of medical professionals. Group therapy is perhaps one of the most effective and successful approaches to dealing with various types of addictions. Whether they are complementary to individual counseling or other types of treatment, group sessions are a vital component of the recovery process. Who Conducts a Group Therapy Session? A specialized therapist or a counselor with a deep understanding of addictions, social interactions, and human psychology is usually in charge of the group therapy session. The purpose of a group meeting is to share experiences with individuals who are also dealing with addiction under the careful moderation and guidance of the counselor. Each member of the group is expected to interact with each other while the counselor leads, briefs, and debriefs the sessions. Becoming a group therapist requires years of study and practice for the program to be efficient. That is why counselors must first obtain their degrees and certifications before they can conduct these meetings. A group therapy session consists of carefully selected individuals who participate voluntarily in the meetings and who fit the group profile. When a group meeting starts, the counselor has already met with each person separately and ensured that everyone who attends is there because it’s the right place for them. Most sessions usually occur once a week, and they last between one and two hours. They take place in a private room where participants sit in a circle and share their experiences. While patients are not expected to divulge their deepest secrets, they are encouraged to share their feelings and experiences. The purpose is to develop healthy coping mechanisms and reactions to stressful events. Some groups have a predetermined number of sessions; others, on the other hand, are ongoing. The predetermined groups last between six and 20 weeks, while the undetermined ones usually take place once a week and are open to everyone – a person can attend once or every week for a year. The most well-known therapy approach for alcohol addiction is the 12-Step Program, which can last 90 days, 120 days, or even one – it depends on the program and how long the person wishes to attend the sessions. Research shows that the more a person attends a program, the more effective the program will be, with 90 days being the minimum recommended. While group therapy is very effective, it does not go as deep as individual therapy. The best outcome is when the patient determines the causes of their addiction and learns how to manage their emotions and cope with their cravings. That requires a combination of treatments, such as individual therapy, experiential sessions, and so on. However, group meetings play a crucial role in helping the patients find emotional support and build the social connections they need. Becoming comfortable with people who are going through the same issues can speed up the recovery process. Because addiction is also a health threat, you can get coverage from your insurance plan. However, it is best to check with your provider and analyze your options. You should also check with the rehabilitation center to see if they offer certain payment plans. Addiction treatment must fit the unique needs of the patient to get the best results. For example, someone who is comfortable around people and likes to engage in social interactions is suited for group therapy. A person who feels shy around people and who would rather have one on one conversations is best suited to attend individual sessions. When looking for a program, a person should think about what outcomes they desire and what would help them the most. Getting acquainted with the programs that are available will make the choice easier. Look for different approaches and understand that addiction therapy isn’t a one-size-fits-all treatment. What may work for others may prove to be inefficient for you. Group therapy is an effective treatment approach when it comes to substance abuse. A specialized therapist conducts and moderates the sessions with the sole purpose of helping the attendees develop healthy responses to stressful situations. That’s exactly why in our rehab group therapy is available. Only men who know how difficult a drug or alcohol addiction is to overcome can fully understand and empathize with each other. Windward Way’s treatment program draws on this addiction treatment modality. Our professionals serve as facilitators to ensure the time is spent productively. Call us now and we can answer any questions about our highly praised recovery strategy for young men: 855-491-7694. 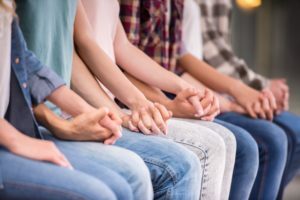 In substance abuse treatment circles, the 12 Step Program has not only a rich history but also a great track record in connecting people with their inner selves to find purpose and meaning in their lives. At Windward Way, we use this group-centered modality of treatment along with many others to bring about lasting changes with the men we serve in both our drug rehab and alcohol rehab programs of recovery. Reach out today to find out how group therapy fits into the larger mosaic of our mission. 855-491-7694.